Supplementary material reads: "Exclusive shot at 20th Century-Fox Studios exclusive for Los Angeles Examiner. For immediate release. (For Wednesday, Oct. 31). 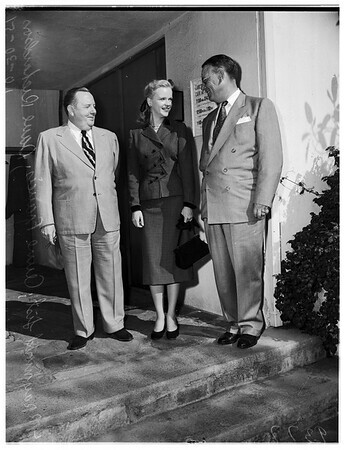 Lovely film actress Anne Francis turns 'guide' for Raymond List, Cheyenne newspaper official, and Dave Richardson, Rock Springs publisher, as they visit 20th Century-Fox Studios. They were in group of 16 Wyoming newspaper, radio and business leaders here for tour of Southland and hosted by studio at luncheon".